The Gutter Ramen is one of our team’s fave meals and it’s perfect for whenever you are short on time (or dimes). The beautiful part about this recipe is that it can all be done in a rice cooker, which makes the clean up super quick and easy. 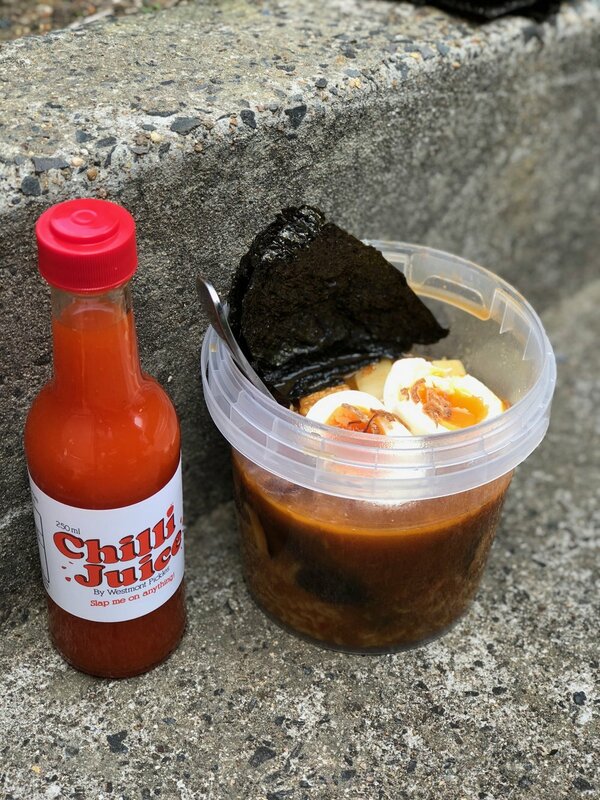 Even though Sydney has some really good Ramen joints around, this recipe is perfect for a quick hit that is cheap cheap cheap. 1. Boil water in rice cooker and gently place your eggs in once boiling. Cook for six minutes, then get’ em out and run under cold water until cooled. Peel your eggs and set aside. 2. Bring roughly 2 cups of water to the boil, then add the packet powder and the dried veggies that come with it. Also add the shiitake, soy sauce, chilli juice, corn and Beer Pickle brine. Simmer for 10 minutes. 3. Add noodle cakes and cook for 2-3 minutes. 4. Divide noodles into bowls and pour the soup on top. Garnish with bamboo shoots and a few sheets of nori. Slice your eggs in half and chuck ‘em in too. Then add some more Chilli Juice if you like it hot. 5. Enjoy in the gutter – or the comfort of your own home. *Find these in all good Asian grocers; and chuck ‘em on everyyyyyything.